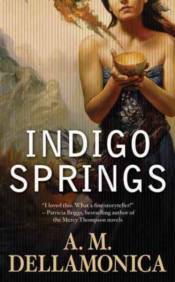 Indigo Springs is a sleepy town where things seem pretty normal . . . until Astrid's father dies and she moves into his house. She discovers that for many years her father had been accessing the magic that flowed, literally, in a blue stream beneath the earth, leaking into his house. When she starts to use the liquid "vitagua" to enchant everyday items, the results seem innocent enough: a "'chanted" watch becomes a charm that means you're always in the right place at the right time; a "'chanted" pendant enables the wearer to convince anyone of anything . . .But as events in Indigo Springs unfold and the true potential of vitagua is revealed, Astrid and her friends unwittingly embark on a journey fraught with power, change, and a future too devastating to contemplate. Friends become enemies and enemies become friends as Astrid discovers secrets from her shrouded childhood that will lead her to a destiny stranger than she could have imagined . . .